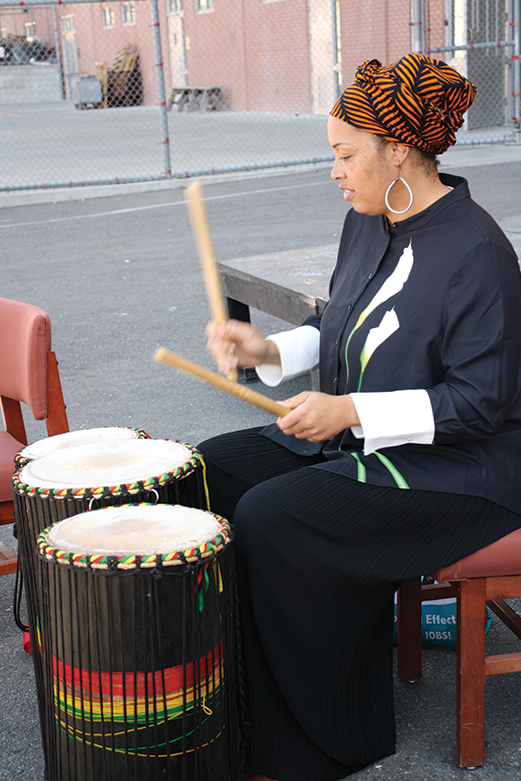 A drum call to gather the population on San Quentin’s Lower Yard was made on Sept. 9 for the “Hope” themed opening of Mental Wellness Week. Incarcerated men answered the drum call of L. Williams, who works in SQ’s mental health department, visitor Serigne Sowto and sat down in a drum circle. They learned to play traditional West African rhythms like the Sente, Danza, and Dun Dun Ba Ba by hand on a congos bass. “Drumming is recreation- al therapy, and it helps the men in the community, so I thought it could help men in here and wanted to bring it here,” L. Williams said. Optimistic about the week, suicide prevention coordinator Rosa Thomas gave two- tone turquoise and purple ribbon stickers to the participants. Outside volunteers in solidarity wore black T-shirts with the suicide prevention ribbon design as a symbol of hope. Remarks about changes in the mental health service in the California Department of Corrections and Rehabilitation (CDCR) were made by mental health administrative personnel. Many of them had positive things to say about life, philosophy and mental health perspectives. Dr. McCarver is at an age where she now uses a cane to walk. When she looked at the men she aims to help, deep concern showed across her face. “I believe hope means a number of different things,” McCarver said, “When a child falls in a park and the parent of the child doesn’t run to help, but all the parents run to help that one child, this is hope. “Or when you’re in the grocery store and you see someone short $10, and in- stead of them having to put some things back, you give them the money so they can have all the groceries their order. The next day in the Garden Chapel a Time of Remembrance was held for those lost by suicide. Their names were read out loud. After the reading of the names, several prisoners who knew some- one stood and shared memories. Andress Yancee, the master of ceremonies, shared a time he noticed a guy who was housed on a lower tier, but he was standing on the fifth tier in West Block. It was out of the ordinary to Yancee, who saw this guy looking over the rail at the ground. Yancee said he felt eerie. “Hey man you look like you can use some coffee,” he offered. The guy was startled by the friendly gesture of Yancee, who just wanted to help. He took the coffee. Later the guy was transfer- ring to another prison and approached Yancee. “Thank you for saying something to me that day. I was about to jump,” the guy said. Yancee prevented the guy from committing suicide. Richard Evans, 65, is serving 30 years to life for a series of burglaries, his third strike. He introduced himself as a man of faith. “We have a small circle of friends, a circle around that small circle of people, and an extended circle of people we are responsible for… have empathy.” He said. An example of a little village at San Quentin is the Prison Yoga Project, led by a woman short in height, eloquent in speech, and fluid in motion, named Chonda Williams. Yoga instructor Williams gave a presentation on day three to explain how the body knows hope. 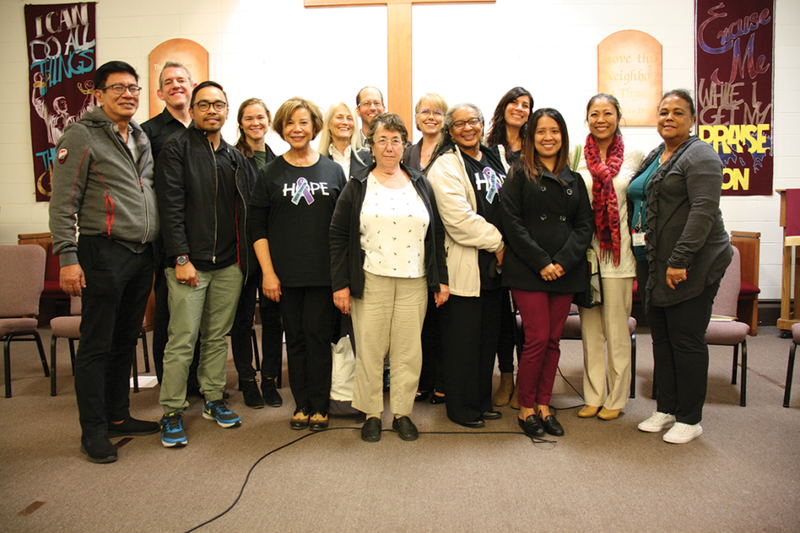 Half way through the week guest speaker Jennifer Shaffer, Executive Director of the Board of Parole Hearings (BPH), visited San Quentin to share how hope prospers in relationships with mental health clinicians. “I think things have changed greatly in our society, and we are more aware how mental health impacts our life.” Shaffer said. “To do this job, we even have to go talk to clinicians and see psychiatrists about our mental health, so don’t think you are the only ones,” she assured listeners. “Mental health week is about being mindful of the fact our mental health is as equally important as our physical health. “The reason we go is for treatment for some type of injury, to move us in a place to be optimal in our individual lives.” Shaffer said. Shaffer addressed other concerns lifers with the possibility of parole had about their psychological assessment reports for the board. She said at the basic level the BPH commissioners are trying to figure out who you are. She encouraged the men to simply be authentic. As the weeklong events dwindled toward the end, there was music performed by incarcerated musicians. The drum circles congregated on the Lower Yard on Sept. 15 and ended the gathering playing to more African beats.